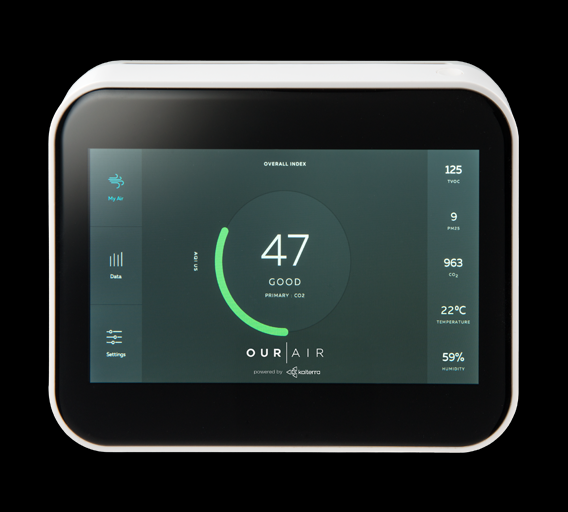 designed to meet global building air quality monitoring standards. The indoor air sensor provides reliable and accurate air quality control solutions. The SPS208 provides all the necessary measurements to adhere to air quality standards which includes temperature, humidity, particulate matter, TVOCs and CO2. The indoor air sensor has an in built interactive touch screen displaying current indoor air quality in the building. It features modern conveniences of monitor data simply with device display, OurAir App and the OurAir web-portal. The indoor air sensor also offers the flexibility in sensing needs along with the handiness of sensor cartridges being able to be removed if not required. It provides the flexibility in sensing needs and sensor cartridge could be replaced for easy sensor calibration. We spend approximately 90% of our time indoors. And it is here that air quality is at its worst. 92% of the world's population faces air pollution that exceeds safe limits. But while the focus today is on outdoor air quality, we spend most of our time indoors. Anything released indoors is about 1,000 times more likely to be breathed in than something released outdoors. The concentrations of some pollutants indoors are often 2 to 5 times higher than typical outdoor concentrations. While it is difficult to defend against air pollution outside, the right air filters can protect your indoor spaces from the dangers of airborne particulates and be energy efficient at the same time.